Breathalyzer - Digital Breath Blood Alcohol Tester Detector - It is a personal digital alcohol detector for use any time you want to determine the presence of alcohol in your blood. 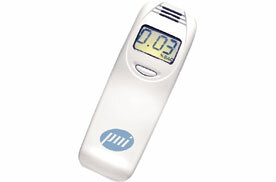 Utilizes advanced semiconductor gas sensor technology to measure the level of alcohol in your blood via a breath sample. Digital Readout! and Small Compact Design!